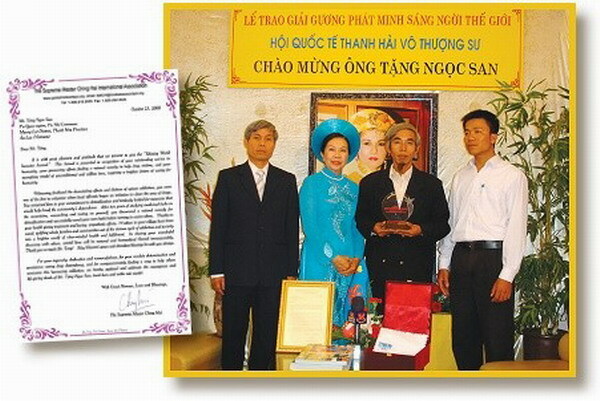 On December 4, Golden Year 5 (2008), Mr. Tặng Ngọc San received the Shining World Inventor Award in recognition of his efforts in discovering a method for drug rehabilitation. Mr. San had previously been an addict for 24 years and during that time, his health deteriorated, his wealth vanished, and his wife and children suffered from starvation. One day, he decided to find a way to escape this prolonged torture. He went on an arduous journey, which took him to many remote mountainous areas. After going through much challenges along the way and thanks to Heaven’s blessing, he was able to gather all the needed 15 ingredients to cure his own addiction and that of others around him. From 2003 to this day, Mr. San has cured nearly 100 people in his local district and other provinces such as Thanh Hóa, Nghệ An, Đồng Tháp, Yên Bái, Hà Nội, Vĩnh Phúc. We wish you great success, Mr. Tăng Ngọc San, for your future endeavor in helping addicts to go back to their normal life and enjoy happiness with their loved ones.